In 1948 the young student Kenneth Snelson attended the summer institute at Black Mountain College. Influenced by Richard Buckminster Fuller’s visions he created the first sculptures based on a very simple, but seemingly magical principle: Tensegrity (portmanteau of tension and integrity). Giving the impression of a cluster of struts floating in the air, tensegrity structures are composed by a set of compression components suspended within a continuous tension network. This results in a structure where ‘compression elements become small islands in a sea of tension’ (Buckminster Fuller 1961). 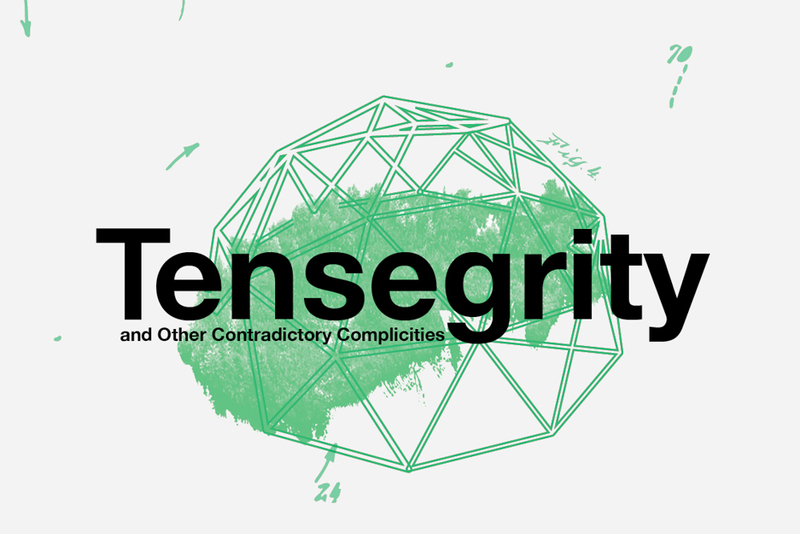 This symposium takes tensegrity as a starting point to examine whether ‘tensional integrity’ is something other than just a spatial structure of struts and strings. Where do we recognise forms of push and pull strategies, tension- pressure relationships and stability-flexibility structures within our fields of research and interests? In the face of he current political climate with social shifts, systemic ruptures and collective upheaval, notions around fragility, tension and dynamic relations become more and more important. With regard to philosophical approaches, tensegrity can be understood as moments of ‘discontinuities installed within the continuity of time’. (Ignasi Solà-Morales 1996). While Solà-Morales refers in his essay ‘Difference’ to built elements of the city within the continuity of time, how can we apply this notion of ‘contradictory complicity’ to other disciplines such as language, performance, history, politics and sociology? A publication and a poster accompany the event. They contain the programme and a collection of research material and ideas. Damian Christinger, writer and curator from Zurich, studied Asian Art History and Intercultural Studies. He was the co-founder, of Christinger De Mayo, a project gallery trying to build bridges between European and Latin American Art, which closed its doors December 2015. He now works as an independent curator and publicist. His main focus is on the construction of “the other” in intercultural relations and art history. His last museum show at the Museum Rietberg featured 21 Swiss artists, who questioned the relationship between the collection of antique non- European art and its local public. His current projects include such different topics as the history of curry, the Swiss Merchant Navy and the Moomins. He worked as a curator for the TBA21 project The Current and is lecturing at the University of the Arts Zurich.